A fascinating interview with Prof. Reza Aslan in which he explains why it is perfectly OK to be traditional, why Al-Qaeda is not anti-modern, and that religious radicalism is on the rise only as a reaction to progressivism (which is also on the rise). Is there really a religious gene? People (especially in the West) are turning more and more to atheism as they become disillusioned with organized religion. Then again there are others who find profound meaning in religion. 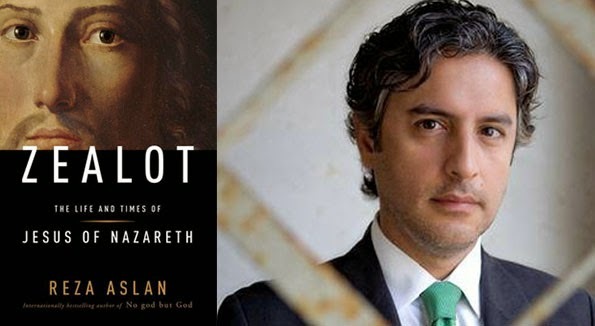 One thing that seems to be of immense significance (and a point not discussed in the article) is that Reza Aslan's father was an atheist, so what was the trigger that led him to reject the ways of his dad and embrace religion? Also he explains why/how he adopted Christianity (but not why he left) and also his reasons for (presently) preferring Islam. You first converted to Christianity and then to Islam. Can you take us through your personal journey of faith? My father is a devout atheist, and I grew up without any religious instruction although I was always very deeply interested in religion and spirituality. My family moved to the United States from Iran in 1979, after Ayatollah Khomeini decided to return to the country. It wasn’t particularly a very good time for Muslims to be in America either, so I spent most of my early 30s pretending to be Mexican. It was at an evangelical youth camp where I first listened to the incredible story of Jesus Christ’s life and teachings in the Gospel — It moved me so much that I immediately gave my life to Jesus. I spent the next couple of years preaching the Gospel to everyone — whether they wanted to hear it or not. As a professor of religions, do you feel that religions are misunderstood or misinterpreted in the modern world? Is it fair to state that religions are undergoing an identity crisis, which in turn, is turning religions towards more extremist and intolerant ideas? I don’t think that’s true at all. Religion is more of a force today than it was more than 100 years ago. I think that religions are in a constant state of evolution. I also believe that religious diversity and religious pluralism are on the rise, but the problem is that people assume that religious radicalism is on the rise. In part, this is because radicalism and fundamentalism are reactionary phenomena. They are a reaction to liberalism and pluralism. If you see certain spikes in religious radicalism, it’s not because religious radicalism is independent or free, or because radicalism is on the rise; it’s because its progressivism, liberalism and diversity is on the rise. Whenever people — for one reason or another — feel left behind in a progressive society, they will rebel and react against it. I think that’s what’s happening right now. Do you think there is disconnect between modernity and being traditionally religious? Do you think this dichotomy fuels intolerance and rigidity? First of all there is nothing wrong with traditionalism and there is nothing wrong with rejecting modernity. That is not a problem we are facing as a society; the problem is with extremism not traditionalism. That’s what we need to constantly remind ourselves of. The problem we are facing is of radicalism and violence. I think it’s a mistake to say radicalism and violence is a direct result of traditionalism or conservatism. As I have mentioned in my second book, the mistake we often make is in thinking that groups like Al-Qaeda are anti-modern; in fact, they are actually products of modernity. They don’t reject modernity, but in a quite sophisticated way, they present an alternative version of modernity. But why does religion remain an overly convenient tool for extremism and violence? Well, religion by no means has a monopoly on extremism. If you look at the last century, which by far has been the bloodiest epoch in human existence, millions of people have been slaughtered in the name of secularism, in the name of atheism, Maoism, Fascism, even nationalism. It is a very narrow view of faith and belief if it is said that religion is a cause of violence. If anything, it is nationalism that has a greater propensity to create violence, not religion. But perhaps, it is to say that violence is in human nature. We will kill each other because of our identity. And we will use any form of identity in order to differentiate from each other or to enact violence against each other — sometimes in the name of religion, at other times in the name of socialism, race, tribe or something else. I find it distasteful when faithful adherents of a religion starts writing scholarly works criticizing the faith of another religion. This doesn't mean that I think the contents of Zealot is wrong. In fact, it is pretty much a rehash of what Bible scholars have discussed in detail in the past. "Rahul Gandhi is not a running item any more"
Is Gypsy really a bad word? Why Hamid Mir was shot..
"We love Pakistan army and ISI"
"When she awoke, her brother was gone"
"Muslims ought to be more communal"
Happy days for (Iranian) Bahais!!! Will "jamai-babu" go to jail? "endorsement of Modi ...lose faith in humanity"
Did ISI order the hit on Hamid Mir? "Dad, don't worry. I've got a life vest on..."
NDTV projects clear majority for NDA!!! "Some can resist these pressures. Others succumb"
Who killed Philip Marshall (and why) ?